ALL IN is an expression that I learned when I started cycling about a year ago. When we are riding in a group it is the last person at the end of the line of cyclists who yells out ALL IN when the group is a cohesive bunch of riders and we are ready to move out or if we have spread out riding up a hill and we are all back in line once we get to the top of the hill. The last rider calls out ALL IN! and we pass it forward so the leader knows we are all together. In my business I am grateful to have a passionate team that loves what they do as much as I do. We could make our motto: ALL IN! This week I am away on holidays and we have had friends coming and going; dinners where there are not enough seats and far too many deserts. I look around at everyone and see the smiles and the laughter and I want to yell: ALL IN! To my partner who helps me and goes above and beyond what I am expecting; I realize that I often do not see all the love and support that is always there from him and I see that his vision of us as a couple is always: ALL IN! And when I finished my meditation this morning and I looked out over the lake and listened to the birds and the squirrels and I realized all I had to be thankful for, I thought to myself, that I am never alone, that all is well no matter what and I said quietly to myself: ALL IN! I am grateful to everyone that is on this journey with me and allows me to feel so safe, leads me when I need to be led, puts me in the middle when I need that, or allows me to be there and to watch and make sure that we are ALL IN! What do you think Felix Baumgartner felt like when he was standing there at 120,000 feet above the earth and had to take that first step? I know exactly how he felt. If you don’t know, then it’s time to get yourself ready because it will be the step that changes your life. For me that first step was about seven years ago and I was at a Rapport Leadership course called Eagle Quest. Eagle Quest is a three-day course that teaches you many things, most of which you didn’t know you needed to learn but you do if you want to follow your dreams and your passions. The final day is a high ropes course and for someone like me who is terrified of heights, that alone was a challenge. Except the weekend was spent preparing us for that day on high and the truth of the matter was that what I though was a fear of heights was anything but that. Let me take you right there to that moment. I stood with one foot ready to go and holding on to that telephone pole with all of my might and I couldn’t hold back the tears any more. I thought of all the other times in my life that I had climbed down. I thought of all of the opportunities that I had let pass me by, the chances I hadn’t taken. I thought of all of the situations I had stayed in because it was easier and safer and all the things I had wanted to do, but I was too afraid to do. And I took a deep breath and I let go of that pole and I took a hold of the guide wire that would help me get across to the other side and I took that first step. And when I took that first step I let go of all of the times that I had held myself back. And I took a second and a third step and I walked across that pole and I never looked back. There were two more courses to get across and I did them one after the other. The final test was a 40-foot telephone pole to climb up and jump off of. I did that too. When I got to the top our instructor called up to me that I didn’t have to stand on it because at that point I think she knew that in my head I thought I could fly! 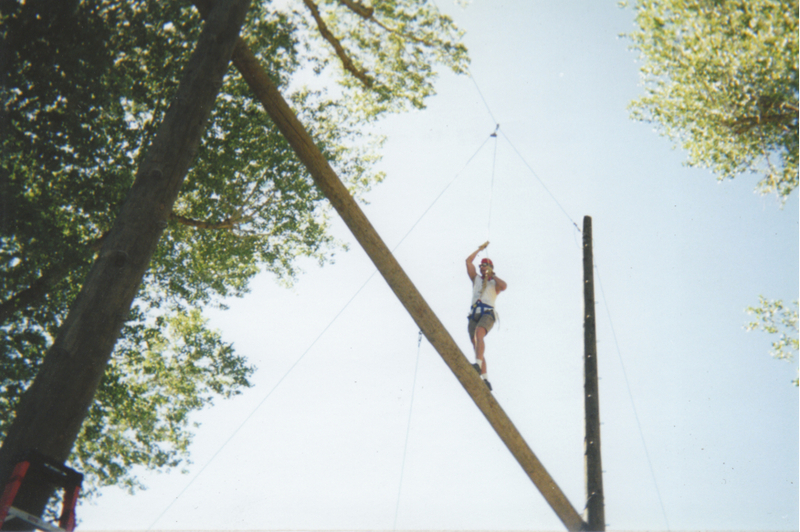 At 6’2” to climb up and stand on a 40 foot pole was just too much and I had made my point to myself, I had let go of the fears that had been holding me back and I had unleashed the passion that I had buried so deep inside of me for so long. I sat on the top of that pole, looked out as far as I could see and then I jumped. I was so free when I flew threw the air. Free because I had found the courage to take that first step. The photo I have included here I keep on my desk at the office and when things get tough or I want to give up on anything, I look at that photo and I smile and I get the same goose bumps I got that day. I get them now as I am writing this. That day is anchored deep inside of me and I hold on to it with great joy. If I am not at my desk when fear starts to invade my head and “those voices” try to make themselves heard, I think of that moment and I move forward and once again I take that first step. Why am I sharing this with you? Because these days I find myself in situations and doing things that I never thought I would have a chance to do or quite honestly was capable of doing. I find myself able to do all, yes all of the things that I have wanted to do in my life and some of which I never knew I wanted to because I was too busy holding on to a telephone pole afraid to take that first step. I can tell you right now you don’t have to sign up for a high ropes course or launch yourself in to space. All you have to do is let go and take that fist step. Let those dreams and those passions you have buried so long ago come out and live where they belong to be shared with the world around you. If you have already taken that first step, then do everything in your power to help others to take theirs. It may seem like the hardest, but I can guarantee you, that first step will be the one you won’t ever forget. And so it went on Sunday nights at our house when I was a child. It could have been any night but that repartee between my father and us four boys and then my brother’s children seemed to be reserved for Sunday nights or holidays like Christmas or Thanksgiving. If everyone was finished and the meal was done the answer was “Yes you may.” If everyone wasn’t and the meal wasn’t then you probably didn’t say it, because the dead silence only happened once. But I have a feeling that all of that has gone by the way side with opening the car door or standing up for someone elderly (not old) on the bus. Although I must admit I have seen that a few times. I was having lunch today with a friend and the waiter knew that he shouldn’t clear our plates until we had both finished. Well, it is right up there with having sufficient and stacking dishes at the table which my friends always tease me about when they are stacking the dishes. It just isn’t done. It’s called common courtesy. It’s called being polite. • Thinking “Wassup” is another way to say hello. And the worst part is I have started to do all of that including the ad infinitum. Change has to start with me I am told so next time you see me this just may be how it goes…. Wait, let me get your chair for you. No, I am sorry, my friend hasn’t finished eating, would you mind waiting to clear the table until we have both finished. A few years ago I wrote a post about being JUICY (Are you juicy? – June 2011), and I published it again here on this blog on Sunday. I am finding these days that being juicy just isn’t enough. Juicy seems to be the first part of the definition of feisty. I thought it would be enough to get me through life with a smile on my face. These days I think I need to go to Step Two: Touchy and Aggressive. Except I don’t really think it is about being either Touchy or Aggressive, I think it is more about being honest and saying it the way it is. “You are going to talk to me like that and think I believe a word you are saying? “It has been three months since you got back to me, and now you are saying you want to work with me because business is a little tougher for you and you need my business? I AM SAYING IT EXACTLY THE WAY IT IS! I am being respectful and honest and only using the F-word in my head (that is F-U-C-K and not F-E-I-S-T-Y) but interestingly enough the response is quite refreshing. Well actually there is a lot of stuttering at first, long pauses at the other end of the phone, and many lines of apologies in the e-mails with closings that have gone from “Kind regards” to “Let’s talk soon!”. The end result is a stronger relationship and the knowledge (and relief) that both sides may be straight up with whatever they need to say. 1. Listen to what that voice in your head is telling you – that you are being given a line, played with, or given the run around. 2. ALWAYS BE RESPECTFUL, POLITE AND HONEST IN WHAT YOU SAY. Remember, you don’t want to play their game or be mean or rude or condescending. 3. Ease into feistiness. It is a bit addictive, once you start; it’s hard to stop. 4. Start with being JUICY. If you haven’t mastered that you will never be able to be FEISTY!